Whether you prefer more of a modern jukebox, or you favour the vintage style: modern with its touchscreen surface, glossy textures and sleek professional colour scheme or vintage with its ultimate quality, craftsmanship and bright glistening lights – you won’t go wrong with picking a jukebox in either design. Despite this, for those who are a jukebox extraordinaire, an aficionado to the box, many see the classical and vintage jukebox as the one and only true jukebox, with their more ‘modern’ counterparts being a little more on the dreary side. However, in the same way that some prefer the more classic Cadillac over the Corolla, there are upsides to both and the modern jukebox, as does the vintage jukebox, rightfully deserves their place. The rise of the modern jukebox has advanced to a level far from its humble beginnings, with the modern jukebox differing in style from mockup vintage designs to a more touchscreen affair. The change from its classic design, that many of us love and know was one of which was necessary, as the era in which it arrived aligned with the release of iPods and MP3 devices that were putting the future of jukeboxes at risk. To ensure a competitive advantage and follow the way in which music technology was going, modern jukeboxes are now usually equipped with the ability to connect to the internet, a touchscreen-based interface and a user-friendly design. The vast change in shape and design that the modern jukebox has acquired is one that didn’t just come about, but was rather deliberate in its final form, with the ex-CEO of one of the biggest modern jukebox providers, TouchTunes, saying that their latest modern jukebox was them designing, developing and building “the jukebox for this era, the era of the screen”. The shiny exterior of a modern jukebox provides many advantages from its counterpart, including being up to date with technical advances, allowing such devices to be much “smarter” and user-friendly. Newer jukeboxes also feature other integrated features that make it more of a multi-use device, such as including an integrated camera that can take photos to be uploaded onto social media and the option to turn the jukebox into a karaoke device, so that you can sing along to your favourite song as the lyrics appear on screen. A modern jukebox, unlike those that came before, is able to play music straight from the web onto the device through ‘streaming’ and does not necessarily need hard copies, if at all, to do so. 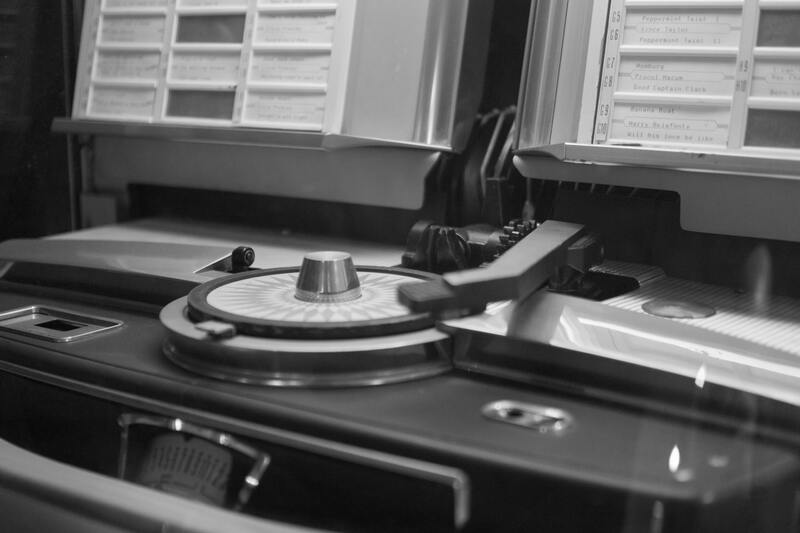 From being able to pull music straight from the web, there is no limit to the number of songs that the jukebox can play and removes the need to change discs in order to play a song from another album, but instead to simply replace that through the click of a button. The new design can also provide a more convenient ‘form’ in the way of which most modern jukeboxes are mounted upon a wall and are much thinner than their previous bulky existence. The vintage jukeboxes are the original classic, the origin that jukeboxes came out of. Coin-operated music can be traced back to the 1800/1900s, but the jukebox in the vintage form that we’ve all come to know can be traced back over 100 years to around the 1890s, where advancements moved on from the cylinder phonographs – a device used to reproduce sound, to the jukebox of today. It could be said that the history of the vintage jukebox was always a quite uncertain one, with its popularity fluctuating throughout the years due to the perception of the device being ‘seedy’ and other more advanced music playing devices taking over from it, such as the radio. Having gone through its prime in the 1940s wartime years, with swing and jazz music pushing these machines into the mainstream, they now can be seen infrequently around old-fashioned venues and in the hands of collectors who wish for a jukebox to make a statement at their event or property. The biggest advantage of vintage jukeboxes is that it’s the true original, the origin of the jukebox as a whole. If you were to mention ‘jukebox’ to someone, many would envision a fine bulky jukebox, maybe rocked up in the corner of a classical jazz bar. The design of a vintage jukebox has a lot to play for too, with its neon-like designs and distinguished patterns that feature on a lot of these classical and vintage boxes, providing it with a unique style and an advantage over the more sleeked-up modern jukebox. The jukebox also provides a very bass-like sound, one of which is very bespoke and unlikely to be replicated on a modern jukebox that would see its music and sound played back through a digital speaker. When it comes down to using any vintage or classical device, one of the reasons many choose to do so is because of the ‘feeling’ it provides the user with. Such feeling is very unique and unmatched on many modern devices, as the hands-on approach to technology has become more simplified and local-friendly, thus the days of pushing various buttons on the box in order to get it to work, the manual changing of the disc and being able to watch the mechanical workings of inside the machine have all gone by us. So whether you prefer your jukebox to be a little more on the vintage side of things, or whether you’d prefer rocking out with a sophisticated modern box, the main thing is that the jukebox as a whole is an amazing piece of musical advancement for the world, bringing about many happy moments – both in the past and still to the present day. At HireJukebox, we offer a variety of modern jukeboxes for your choosing, so if you’re looking for a jukebox to be installed within 7 days, simply contact us to speak to one of our team today.